Once again Small Business Service Week happens again December 12 – 18th to encourage consumers to support small businesses that offer service as their main product. Unlike Small Business Saturday which was started by a big corporation to give small business a boost after Black Friday, Small Business Service Week was started by a local small business to encourage consumers to support small businesses that offer service as their main product, especially during the holiday season. “Most consumers don’t realize that there are many service based businesses that offer gift certificates or special deals during the holidays. Many times service based businesses are overlooked during the holidays and especially during Small Business Saturday which wasn’t even started by a local small business. 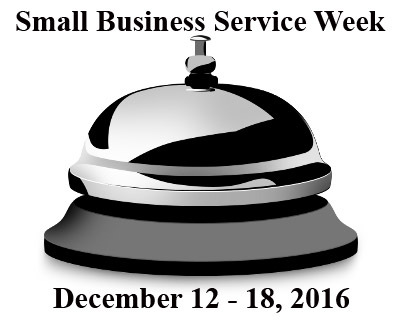 Small Service Business Week is truly something that was created by small business and many people don’t think to give the gift of service to someone on their holiday list,” said Nohl Rosen who owns Panther TEK a local IT company based in Wickenburg, AZ which came up with the idea 6 years ago. Rosen says that his company offers gift certificates for sale to customers and says that there are quite a number of other service based businesses that may offer them or gift cards for purchase. “Purchasing services is something people do quite regularly during the year for their own needs but they may not think of giving the gift of it to someone on their holiday list. Believe it or not there are plenty of service based businesses that offer gift certificates for sale if people ask about them. There are many service based businesses which could use the boost this holiday season whether they offer computer repair or veterinary services,” Rosen added. Panther TEK has started an event page for Small Business Service Week on Facebook at https://www.facebook.com/events/554504021412589/. Other small businesses are welcome to post information about their businesses on it.